The Vatican Philatelic and Numismatic Office is marking the 100th anniversary of the Congregation for Eastern Churches with a stamp featuring details from the chapel in the congregation’s office. The stamp will be released 7 September. Read more about the congregation’s anniversary here. Syrians who were staying at a temporary shelter in Jibrin, on the outskirts of Aleppo, are transported to areas currently controlled by the Syrian regime in eastern Aleppo on 16 August 2017. An advisor to Syria’s president says the war is nearly over. when Mongols conquered much of Asia. The decline of Christianity in the Middle East did not occur over night. It took over a millennium for Christians to go from being a slight majority of the population of the Middle East to being 5 percent at present. When did it start? We see the beginnings of decline by the 9th century. Initially, the Muslim conquerors discouraged the People of the Book, Christians, from converting to Islam. The benefits which the conquerors enjoyed were initially not given to non-Arab converts to Islam. But as the caliphate developed into a multi-ethnic, multi-religious state, those privileges were granted to all converts, providing incentives for Christians to convert to Islam. Under the Abbasid Caliphs (750-1258) there were often dialogues/debates in which Christian and Muslim theologians debated the superiority of their own faiths. By the 9th century, though, we notice subtle and not so subtle changes taking place. Since many of these debates have survived in written form, we can follow their development. (You can read more about that here.) Although for the most part, there was no violence exerted on Christians to convert to Islam, subtler and perhaps more powerful incentives were at work: social status, political status and financial advantage. While there does not seem to have been any mass conversion to Islam, the decline had begun. At the beginning of the 13th century, nomadic groups in north central Asia began a migration and conquest. In 1258, Mongols conquered Baghdad and brought the Abbasid Caliphate to an end. By 1300, they had conquered China, all of Central and Western Asia and parts of Eastern Europe. Until the advent of ISIS, the Middle East had not experienced wanton destruction such a scale since the Mongol invasions. The infrastructure of the multi-ethnic, multi-religious caliphate was destroyed — and with it, most of the Christian infrastructure in the region. To be sure, there would not be a permanent vacuum in the Middle East. Smaller groups of Muslims formed Khanates and Sultanates which often competed with each other for the position which the Abbasid Caliphate had possessed and which was now gone forever. Even towards the end of the caliphate, one notices the presence of Turkic people in positions of power. After the demise of the caliphate, more and more of these groups move into the Middle East and begin to establish governments. One of these groups, the Oghuz Turks, was to begin the most important empire in Europe and Asia for almost 600 years. The Osmanli family formed a dynasty, the Ottomans, which would conquer the entire Middle East and much of Central Europe until its dissolution in 1923. The Ottoman Empire was inspired by the ghazi or raiding tradition and engaged in almost constant raids against their non-Muslim and Muslim neighbors. In many ways, the situation of Christians and non-Ottoman Muslims under the Ottomans was similar. Both were subjects. However, there were several factors which made the situation of Christians worse. Christians were becoming a minority lacking the “demographic depth” of the Arab Muslims, making any recovery very difficult. The Crusades (roughly 11th to 13th centuries) and the later constant Ottoman attacks in Christian central Europe gave Christians in the Ottoman Empire the air of being “the foreign enemy” or, worse, a “fifth column.” Forced conversions of Christians to Islam had been rare. However, the Janissaries, the Ottoman shock troops, were originally manned by young Christian boys kidnapped from (mostly) Balkan countries, forced to convert to Islam and then trained as the personal troops of the Sultan. Relations between Christians and Ottoman Turks are memorialized in several Catholic holy days. The Feast of the Name of Mary (12 September) commemorates the defeat of the Ottoman armies at Vienna in 1683 and the Feast of the Holy Rosary (7 October) commemorates the Christian victory at the naval battle of Lepanto in 1571. It’s no accident that these holy days are linked to battles; the Ottoman Empire was in an almost constant state of war with Eastern Europe until the end of the 17th century. The time of the Umayyad and Abbasid Christian-Muslim dialogues was over. For the Christians in the West, Islam — in the form of the Ottoman Empire — was not an opportunity for dialogue, but a threat. Christians in the East were considered objects of suspicion — sympathizers of the Christian powers in Europe — and not people for dialogue. Christians in Syria and Mesopotamia never really recovered from the Mongol invasions and destruction. Any opportunity to recover was greatly diminished under the Ottomans. Christians went from being high officials and respected scholars under the caliphates to being a poor, shrinking and suspect minority under the Ottomans. As we will see, the events of the 20th and 21st centuries would make the situation of Christians in the Middle East even worse. The Vatican is celebrating the 100th anniversary of the establishment of the Congregation for Eastern Churches, an office that supports the Eastern Catholic churches and strives to ensure that the universal Catholic Church treasures its diversity, including in liturgy, spirituality and even canon law. Coincidentally established five months before the Russian Revolution, the congregation continually has had to face the real persecution and threatened existence of some of the Eastern churches it was founded to fortify. Until 1989-90, many of the Byzantine Catholic churches — including, notably, the Ukrainian Catholic Church, the largest of all the Eastern churches — were either outlawed or severely repressed by the communist governments of Eastern Europe, said Archbishop Cyril Vasil, a member of the Slovak Catholic Church and secretary of the congregation. No sooner had the Soviet bloc disintegrated and once-persecuted churches begun to flourish, then the first Gulf War broke out. And then there was the invasion of Iraq. And the turmoil of the Arab Spring across North Africa. Then the war in Syria. And Israeli-Palestinian tensions continue. The Chaldean, Syriac Catholic, Coptic Catholic, Melkite and Maronite churches have paid a high price. “In all of this, the Eastern churches suffer the most because they find themselves crushed in the struggle between bigger powers, both local and global,” Archbishop Vasil said in mid-August. Even those conflicts that are not taking direct aim at Christians in the Middle East make life extremely difficult for them, and so many decide to seek a more peaceful life for themselves and their families outside the region. One impact of the “exodus,” he said, is the greater globalization of the Catholic Church. While 100 years ago, when the Congregation for Eastern Churches was established, only a few Eastern churches had eparchies — dioceses — outside their traditional homelands, today they can be found in Australia, North and South America and scattered across Western Europe. In countries like Italy, where thousands of Ukrainians and Romanians have come to work, they add ritual diversity to the expressions of Catholicism already found there, he said. The growing movement of people around the globe means that part of the congregation’s job is to work with the Latin-rite bishops and dioceses, “sensitizing church public opinion” to the existence, heritage, needs and gifts of the Eastern Catholics moving into their communities, the archbishop said. Where an Eastern Catholic hierarchy has not been established, the local Latin-rite bishop has a responsibility “to accept, welcome and give respectful support to the Eastern Catholics” as their communities grow and become more stable. Although it has only 26 employees — counting the prefect, Cardinal Leonardo Sandri, and the receptionist — the Congregation for Eastern Churches works with 23 Eastern Catholic churches and communities, fulfilling the same tasks that for Latin-rite Catholics fall to the congregations for bishops, clergy, religious, divine worship and education. It supports the Pontifical Oriental Institute, which offers advanced degrees in Eastern Christian liturgy, spirituality and canon law. And it also coordinates the work of a funding network known by the Italian acronym ROACO; the U.S.-based Catholic Near East Welfare Association and Pontifical Mission for Palestine are part of that network. The congregation’s approach in some areas is different than its Latin-rite counterparts because it follows the Eastern Catholic traditions and the Code of Canons of the Eastern Churches. For instance, some of the Eastern churches ordain married men to the priesthood. And, like the Congregation for Bishops, the Congregation for Eastern Churches helps prepare the nomination of bishops by Pope Francis, but only for dioceses outside the Eastern churches’ traditional homeland. The Eastern Catholic synods of bishops elect new bishops closer to home and submit their names to the pope for his assent. But the congregation’s primary concern is the survival of the Eastern Catholic churches, which is an issue not only in places where Eastern Catholics are threatened with death or driven from their homelands by war. Archbishop Vasil said others risk losing their Eastern Catholic identity through assimilation. Some of the blame, at least before the Second Vatican Council, lies with the Vatican and the Latin-rite hierarchy and religious orders, who, for decades encouraged Eastern Catholics to be more like their Latin-rite brothers and sisters. Vatican II urged a recovery of the Eastern Catholic traditions, liturgy and spirituality. But, especially for Eastern Catholics living far from their churches’ homelands, uprooting vestiges of the “Latinization” can prove difficult, Archbishop Vasil said. Using his own Slovak Catholic Church as an example, he said parishes have been asked beginning 1 September to return to the Eastern Catholic tradition of administering baptism, chrismation (confirmation) and the Eucharist together at the same liturgy, even for infants. In Slovakia, as in some parishes in North America, Eastern Catholics adopted the Latin-rite church’s practicing of withholding the Eucharist until a child is about 7 and then celebrating the child’s first Communion. Especially for Eastern Christians whose ancestors immigrated two or three or four generations ago, the archbishop said, maintaining their specific identity as Chaldean, Ruthenian or Syro-Malankara Catholics is a challenge. Catholics attend a Divine Liturgy at the Assumption of the Blessed Virgin Mary Ukrainian Catholic Churcn in Centralia, Pennsylvania. The church has been named a pilgrimage holy site by Major Archbishop Sviatoslav Shevchuk of Kiev-Halych, Ukraine. The Assumption of the Blessed Virgin Mary Ukrainian Catholic Church sits on a serene Pennsylvania mountain and overlooks the abandoned, desolate borough of Centralia. The town is a memory, but the church still serves a thriving parish family, with congregants driving to the hilltop on Sundays and holy days from communities throughout the area. The church and the grounds surrounding it will be the site of the Ukrainian Catholic Archeparchy of Philadelphia’s holy pilgrimage on 27 August, the eve of the feast of the Dormition of the Holy Mother of God. The pilgrimage begins at noon with the celebration of the Divine Liturgy with Archbishop Stefan Soroka, head of the Philadelphia archeparchy and the metropolitan of U.S. Ukrainian Catholics in the United States. The homilist will be the Rev. John M. Fields, an archpriest of the archeparchy. After the Divine Liturgy, a procession will take place from the church with a replica of the Icon of Our Lady of Pochaiv, where it will be placed in the outside chapel. The town of Centralia was destroyed by an underground mine fire, which began in 1962 and resulted in the relocation of almost all the residents and the demolition of all but a few buildings. But Assumption Church, capped with its three onion-shaped blue domes, remains on the hilltop, the same as when the first services were held there in 1912. The parish was founded on 15 August 1911. On 28 August 2011, Archbishop Soroka was the main celebrant and homilist when the parish celebrated the centennial of its founding. “After 100 years, you are all doing the work the founders of the church wanted to do as well, you are giving service to others, coming together in hard times and good,” he said. During his historic visit in November 2015, Major Archbishop Sviatoslav Shevchuk of Kiev-Halych, Ukraine, the leader of more than 5 million Ukrainian Catholics around the globe, marveled at the continuing presence of the church in Centralia. He also noted how this coal region parish fostered the vocations of four priests and three religious sisters. As a result of his visit and with Archbishop Soroka’s encouragement, the place was designated a holy site of pilgrimage. The first pilgrimage took place in 2016 and the Rev. Michael Hutsko, Assumption’s pastor, has invited all people of faith to join with Archbishop Soroka and clergy for a day of prayer and spiritual blessings 27 August. In the afternoon after the Divine Liturgy, an opportunity for confession will be available for the pilgrims at various locations throughout the church grounds. A 2 p.m. living rosary will be prayed before the historic and jeweled 18th-century copy of the Icon of Our Lady of Pochaiv. Conventual Franciscan Father Martin Kobos, pastor of Mother Cabrini Church in Shamokin, will provide a reflection at the conclusion of the rosary. The icon and relics of Blessed Mykolay Charnetsky (1884-1959) will reside in the church for veneration throughout the day. The Redemptorist priest was martyred for the faith. In 1975, the Australian government passed the Racial Discrimination Act, which ended these racially based immigration policies. Subsequently, the country has seen an influx of non-European immigrants. In addition, the indigenous population has rebounded. Among these recent arrivals have been Eastern Christians — Armenians and Assyrians; Chaldean, Maronite, Melkite Greek and Ukrainian Greek Catholics; and Coptic, Greek, Macedonian, Russian, Serbian and Syriac Orthodox — whose small but vibrant communities are developing a multicultural Australia. To learn more, I visited three. Over a lunch of New Zealand mussels, kangaroo steaks and a bottle of local cabernet sauvignon, Bishop Peter Stasiuk, who prepared the meal with relish, spoke about his small but growing community of Ukrainian Greek Catholics. The Canadian-born bishop is responsible for 34,000 souls scattered throughout Australia and New Zealand. Most Ukrainian Greek Catholics, however, live in Melbourne and Sydney. This back-and-forth is representative of the Ukrainian Greek Catholic experience in Australia, Bishop Peter said, an experience not unlike that of Ukrainian Greek Catholics in North America. To a large degree, Australia’s Ukrainian Greek Catholics have assimilated, though they remain proud of their cultural heritage. 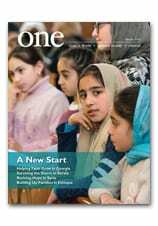 Check out more in the May 2007 edition of ONE. Families affected by flooding are seen in Jakhalabandha, India, on 13 August. "The Time Has Come to Make a Prophetic Cry"
“The time has come to make a prophetic cry” and to speak “the truth that frees us in the spirit of the Gospel,” the Council of the Eastern Patriarchs said in a statement on 11 August after a meeting in Diman, Lebanon. “We, the custodians of the ‘small flocks,’ are hurting because of the exodus of Christians from their native lands in the Middle East,” the patriarchs said. “Our call today is to become the yeast in the dough and a shining light in a world that is thirsty for the life-giving spirit,” they said. The statement included the Christian leaders’ assessments of the countries in the region. They encouraged the Iraqi faithful to remain in the country to preserve their civilization and help build a new civilian state. “We know that the economic and security situation has led to the exodus of many of our Christian children from Palestine, but the Holy Land needs to be present, even if some sacrifices are needed in order to reach a political solution in which Jerusalem would be the capital of two peoples and a holy city open to all,” the patriarchs said in their statement. The delegation of patriarchs met with Lebanese President Michel on 9 August. They asked him to resolve the issue of displaced persons and refugees who have become “a heavy burden and a political, economic, security and social threat to Lebanon.” Between one-quarter and one-third of the population of Lebanon is refugees; more than a million are Syrians.